ASHTABULA - The 3rd annual Art in the Alley will take place on Saturday, Sept. 1, from 3-8 p.m., in the alleys around Dublin Down Restaurant on Main Avenue in downtown Ashtabula. Art in the Alley is a judged show, mixed-media event for artists who create photography, graphite, ink, watercolor, acrylics, oils, ceramics, fiber art, three-dimensional work and more. Area artists will be showing and selling their work at this free event. Live music will flow from Dublin Down, Park Avenue Winery will host a Wine Garden, Deborah Hill will be doing face painting, Louie Spencer will be drawing caricatures and Eric Schwarz will have a live demo of wood turning. “We had [Schwarz] one other year, and people just grouped around to watch,” said Larry Fargo, president of Fargo Machinery. The Ashtabula Downtown Development Association is organizing the event, with sponsorship from Ziegler Heating Company. Art in the Alley was created to showcase the many talented local artists in the area. In preparation for the event, workers cut away the thick Plexiglas covering of the walkway, used each year for the art event. Fargo said the property is owned by Stu Cordell and Jeff Coxon, who are paying for materials. The plastic has been replaced by green sheet metal and material to support it, and then decorative lighting from Webber Electric, he said. “This is all leading up to Art in the Alley,” Fargo said. The new walkway allows for a sparkly atmosphere for the event. After the event, there will be an artists’ party for participating artists at Dublin Down. The general public is invited to mingle and meet the artists. “We wanted to show our appreciation for the artist participating in the event,” Fargo said. Deborah Hill, Jo Misener, Dave Clint, Doug Spencer, Molly Taylor and Mary Ellen Higley are the committee members, and Fargo is the chair. Judges are Micheline Guerriero, Mary Ellen Higley and County Commissioner Cassey Kozlowski. “We invite everybody to come on out and have a good time,” Fargo said. 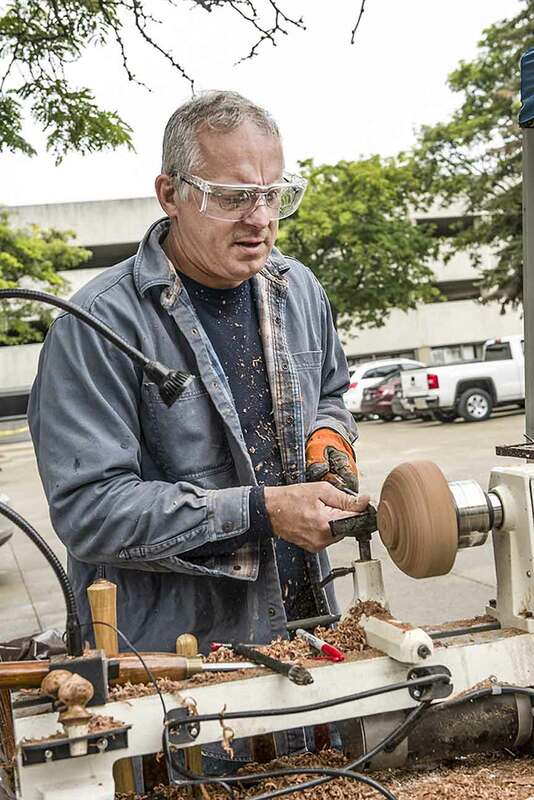 Eric Schwarz will once again have a live demo of wood turning. He is pictured here at last year’s Art in the Alley.